FAU has signed an agreement with the São Paulo Research Foundation (FAPESP) in São Paulo, Brazil. ‘With this agreement we want to strengthen our collaboration with top universities in the Brazilian state of São Paulo, which involves many research contacts and co-operations across all faculties,’ explains Prof. Dr. Günter Leugering, Vice President for International Affairs. FAU has been working closely with Universidade de São Paulo (USP), Universidade Estadual Paulista ‘Júlio de Mesquita Filho’ (UNESP), Universidade Federal de São Paulo (UNIFESP), Universidade Estadual de Campinas (UNICAMP), and Pontificia Universidade Católica de São Paulo (PUCSP) – universities in Bavaria’s partner region São Paulo – for many years. There are student exchanges between the universities, while many FAU researchers from all disciplines are already working on research projects and carrying out workshops with colleagues on the other side of the Atlantic. The Central Institute of Healthcare Engineering (ZiMT) at FAU which brings together expertise in healthcare engineering from research, teaching and industry has been working in the region, which is developing a reputation for its research, for a long time. Furthermore, it is of an advantage for FAU that companies such as Siemens and Audi that already collaborate with the University in many different areas are investing in Brazil, and in São Paulo in particular. This creates a unique opportunity for new joint projects. ‘Through shared calls for applications we will promote excellent research projects in all subjects at both locations and make the top-level research at FAU more visible on an international level,’ Prof. Leugering says. The aim of the collaboration is for the parties to provide equal funding for joint research projects in the form of matching funds. Specific calls for applications for such joint projects will be agreed upon during a delegation of the FAU’s top management in November 2015. 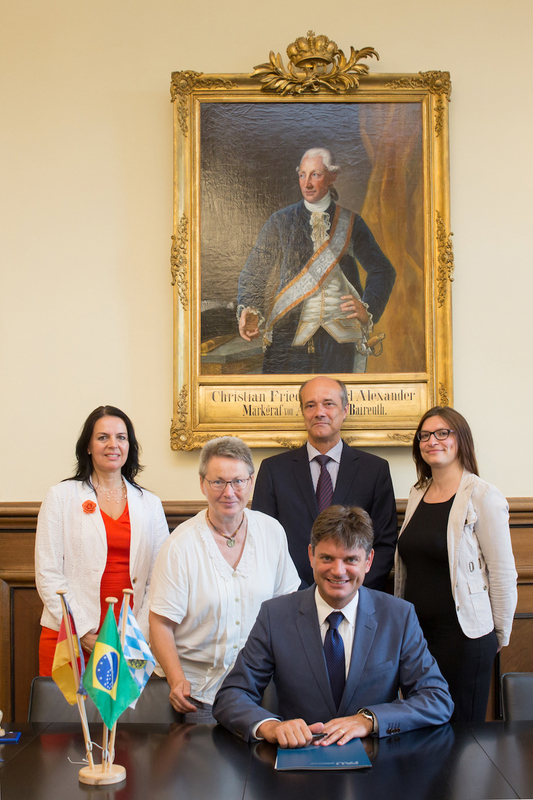 Prior to the signing of the agreement, the Bavarian University Centre for Latin America (BAYLAT) hosted FAPESP Week Munich in October 2014. FAPESP Week Munich, which was organised with the support of the Bavarian State Ministry of Education, Science and the Arts (StMBW) and in collaboration with Deutsches Museum in Munich, was the first event of its kind in Germany and brought researchers from São Paulo and Germany – in particular Bavaria, São Paulo’s partner region – together. Shared research interests were identified, including biotechnology, nanotechnology and photonics, energy, and the relationship between humans and the environment, in particular. The Bavarian University Centre for Latin America (BAYLAT) is a service centre, based at FAU, which operates across the state of Bavaria and was set up by the Bavarian State Ministry of Sciences, Research and the Arts. BAYLAT promotes networking between universities and research institutions in Bavaria and Latin America and aims to increase awareness of Bavaria’s strength in technology, innovation, research and teaching in Latin America. BAYLAT’s goals are directly linked with the internationalisation strategies of universities and higher education institutions in the Free State of Bavaria. The São Paulo Research Foundation (FAPESP) is a foundation which provides funding for research in all disciplines. FAPESP has a network of contacts which provide access to many opportunities for collaboration and includes renowned research organisations such as the German Research Foundation (DFG) and the German Academic Exchange Service (DAAD), research institutions such as Fraunhofer-Gesellschaft, and universities all over the world, including the universities of Oxford, Cambridge, Sydney and Toronto. An agreement between FAPESP and the Bavarian State Ministry of Education, Science and the Arts was signed in 2012. FAU was the second German university to become a partner of FAPESP, after the University of Münster. The Brazilian organisation aims to bring together the best researchers from around the globe and support joint projects through funding. FAPESP is an important strategic partner for Bavaria as it is the best in Latin America when it comes to research quality and funding. Around one percent of tax revenue in the state of São Paulo is made available to FAPESP.